Let’s look at some of the most important stock market terms you’ll encounter as you learn how to trade stocks. Feel free to bookmark this page so you can return to it later as a handy reference. An annual report is a report prepared by a company that’s intended to impress shareholders. It contains tons of information about the company, from its cash flow to its management strategy. When you read an annual report, you’re judging the company’s solvency and financial situation. Arbitrage refers to buying and selling the same security on different markets and at different price points. For instance, if stock XYZ is trading at $10 on one market and $10.50 on another, the trader could buy X shares for $10 and sell them for $10.50 on the other market, pocketing the difference. When an investor buys more of a stock as the price goes down. This makes it so your average purchase price decreases. You might use this strategy if you believe that the general consensus about a company is wrong, so you expect the stock price to rebound later. Trading talk for the stock market being in a downward trend, or a period of falling stock prices. This is the opposite of a bull market. If a stock price plummets, it’s very bearish. A measurement of the relationship between the price of a stock and the movement of the whole market. If stock XYZ has a beta of 1.5, that means that for every 1 point move in the market, stock XYZ moves 1.5 points, and vice versa. The stocks behind large, industry-leading companies. They offer a stable record of significant dividend payments and have a reputation of sound fiscal management. The expression is thought to have been derived from blue gambling chips, which is the highest denomination of chips used in casinos. This stock market term is a little murky. Technically, it’s just another name for the stock market and originates from a house in which wealthy men gathered to trade shares. However, when you hear it in today’s conversations about the stock market, it usually either refers to the Paris stock exchange or to a non-U.S. stock exchange. When the stock market as a whole is in a prolonged period of increasing stock prices. It’s the opposite of a bear market. A single stock can be bullish or bearish too, as can a sector, which I’ll describe later on. A person who buys or sells an investment for you in exchange for a fee (a commission). The bid is the amount of money a trader is willing to pay per share for a given stock. It’s balanced against the ask price, which is what a seller wants per share of that same stock, and the spread is the difference between those two prices. The NYSE and Nasdaq close at 4 p.m., with after-hours trading continuing until 8 p.m. The close simply refers to the time at which a stock exchange closes to trading. A portion of a company’s earnings that is paid to shareholders, or people that own that company’s stock, on a quarterly or annual basis. Not all companies pay dividends. For instance, if you trade penny stocks, you’re likely not after dividends. A place in which different investments are traded. The most well-known exchanges in the United States are the New York Stock Exchange (NYSE) and the Nasdaq. When an order to buy or sell has been completed, the trader has executed the transaction. If you put in an order to sell 100 shares, this means that all 100 shares have been sold. In its most simplest stock market terms, a haircut is an extremely thin spread between the bid and ask prices of a given stock. It can also refer to a situation in which a stock price gets reduced by a specific percentage for margin trades or other purposes. A high refers to a market milestone in which a stock or index reaches a greater price point than previously. Record highs can signal that a stock or index has never reached the current price point, but there are also time-constrained highs, such as 30-day highs. A benchmark that is used as a reference marker for traders and portfolio managers. A 10 percent return may sound good, but if the market index returned 12 percent, then you didn’t do very well since you could have just invested in an index fund and saved time by not trading frequently. Examples are the Dow Jones Industrial Average and Standard & Poor’s 500. An IPO is the first sale or offering of a stock by a company to the public. It happens when a company decides to go public rather than remain solely owned by private or inside investors. The Securities Exchange Commission (SEC) has strict rules that companies must follow before issuing an IPO. I’m not a fan of leverage, but it’s good for you to know this stock market term. When you use leverage, you borrow shares in a stock from your broker with the goal of increasing your profit. If you borrow shares and sell them all at a higher price point, you return the shares and keep the difference. It’s a dangerous game that I urge you to avoid playing. Low is the opposite of high. It represents a lower price point for a stock or index. A margin account lets a person borrow money (take out a loan, essentially) from a broker to purchase an investment. The difference between the amount of the loan and the price of the securities is called the margin. Trading on margin can be dangerous because, if you’re wrong about the direction in which the stock will go, you can lose significant cash. You must often maintain a minimum balance in a margin account. A stock’s average price-per-share during a specific period of time is called its moving average. Some common time frames to study in terms of a stock’s moving average include 50- and 200-day moving averages. In the United States, the stock market opens at 9:30 a.m. Eastern time every day. It’s based on the trading hours of the Nasdaq and NYSE. Pre-market trading hours begin at 4:30 a.m. Eastern, but most traders don’t begin paying attention until about 8 a.m. Essentially, open refers to the time at which people can begin trading on a particular exchange. An investor’s bid to buy or sell a certain amount of stock or option contracts constitutes an order. You have to put an order in to buy or sell 100 shares of stock, for instance. The term “pink sheets” refers most commonly to penny stocks, which are traded at $5 per share or less. They’re also called over-the-counter stocks because that’s how they are traded. You won’t find them on the Nasdaq or NYSE, or any other major exchange, and they’re often smaller companies. A collection of investments owned by an investor makes up his or her portfolio. You can have as few as one stock in a portfolio, but you can also own an infinite amount of stocks or other securities. Information on a stock’s latest trading price tells you its quote. This is sometimes delayed by 20 minutes unless you’re using an actual broker trading platform. A rapid increase in the general price level of the market or of the price of a stock is known as a rally. Depending on the overall environment, it might be called a bull rally or a bear rally. In a bear market, upward trends of as little as 10 percent can qualify as a rally. A group of stocks that are in the same industry belong to the same sector. An example would be the technology sector, which includes companies like Apple and Microsoft. Some traders prefer to trade in a specific sector, such as energy, because they know the industry well and can better predict stock price fluctuations. Any market in which shares of a particular company are bought and sold. The stock market is an example — and probably the most significant example — of a share market. When you short-sell a stock, you borrow shares from someone else with the promise to return them at a point down the road. You then sell the stock for a profit. It’s a way to take advantage of a stock that you believe will decrease in price. After you sell short, you can buy back the shares at the lower price point and take the difference in price as your profit. I use short selling on a regular basis. It’s often a smart move in a volatile market if you see patterns that indicate a sharp downward turn for a stock. This is the difference between the bid and the ask prices of a stock, or the amount for which someone is willing to buy it and the amount for which someone is willing to sell it. For instance, if a trader is willing to trade XYZ stock for $10 and a buyer is willing to pay $9 for it, the spread is $1. A stock symbol is a one- to four-character alphabetic root symbol that represents a publicly traded company on a stock exchange. Apple’s stock symbol is AAPL, while Walmart’s is WMT. The price movements of a stock or the stock market as a whole. Highly volatile stocks are those with extreme daily up and down movements and wide intraday trading ranges. This is often common with stocks that are thinly traded or have low trading volumes. I’m a big fan of high-volatility stocks because I can make a big profit off spikes or dips, depending on how I’m trading, in a short period of time. High volatility often makes trading more exciting, but it’s also risky if you’re inexperienced. The number of shares of stock traded during a particular time period, normally measured in average daily trading volume. Volume can also mean the number of shares you purchase of a given stock. For instance, buying 2,000 shares of a company is a higher-volume purchase than buying 20 shares. Often refers to the measure of the return on an investment that is received from the payment of a dividend. This is determined by dividing the annual dividend amount by the price paid for the stock. If you bought stock XYZ for $40 per share and it pays a $1.00-per-year dividend, you have a “yield” of 2.5 percent. 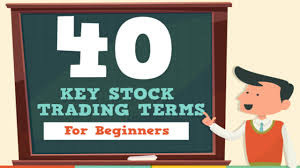 Knowing your stock market terms will make you a better trader. It takes time to grasp the intricacies of securities trading, but once you do, the stock market terms above will become part of your daily vocabulary. I urge you to quiz yourself on stock market terms until you’re highly familiar with them all. You can also explore other stock market terms as they pop up in your research so you don’t get confused. If you’re interested in learning how to trade stocks, consider applying for the Trading Challenge. I’m currently hunting for my next successful student, and I look forward to working with you in the future.